“El Señor va sobre el tiempo flotando como un velero. Nadie puede abrir semilla en el corazón del sueño. El tiempo va sobre el sueño hundido hasta los cabellos. Ayer y mañana comen obscuras flores de duelo”. With these words begins La Leyenda del Tiempo (The Legend of Time), the most recognised work of Camarón de la Isla, the most famous flamenco artist, exalted as a semi-god of his art. And thus, floating on time, in the heart of sleep, drifts flamenco into our days. From the far-off lands of India and Egypt until arriving to Andalusia, where the gypsy people discovered traditional Spanish folklore and mixed with the Arabic people from African shores. Flamenco is at the heart of identity of the gypsy people. A group traditionally marginalised and excluded from society, who have fought to maintain their culture and freedom. It’s due to this determined resistance that flamenco music has recently started to emerge from its marginalisation and to be recognised as an expression of cultural significance, even managing to become a global trademark of Southern Spain. Within flamenco the sadness, pain and fatalism of an oppressed people mingle with the joy flowing in the blood of the gypsies, the very joy that enables them to bear such hardships. Flamenco music is divided into many styles or “palos” depending on its rhythmic pattern and musical or geographical origin. The most common of the many “palos” are “la seguidilla”, “el fandango”, “los tanguillos”, “la soleá”, “la bulería”, “la alegría”, “la sevillana” and “la rumba”. The guitar is the most characteristic instrument of flamenco. The flamenco guitar is lighter and narrower than the classical guitar and is normally made of cypress, cedar or pine wood. The most famous “tocaor” is probably Paco de Lucía, who collaborated with Camarón in producing some of the most mythical flamenco recordings. The second most used instrument in flamenco is none other than the palms of the hand. The “palmeros” (flamenco musicians who provide the rhythmic hand clapping) accompany the guitar and mark the beat required by each “palo”. Another instrument that has recently become widely incorporated into flamenco is the Peruvian percussion instrument known as the “cajón flamenco”, a type of wooden box upon which the artist sits to play. With the constant evolution of flamenco, other more unusual instruments, such as the flute, have also found their way into the art. But flamenco is not only music. An important part of this artistic expression is the dance. Sensual and full of strength, irrelevant of whether it’s performed by a man or a woman, it is distinguished by its characteristic arm movements and the dancer’s skillful use of their legs to stamp their heels on the floor or “taconear”. This stamping movement, or “taconeo”, consists of following the rhythm of the music by stamping on the floor with the heels of their shoes while dancing. Usually, flamenco performances are done on “tablaos flamencos”, wooden-floored stages, upon which the powerful and often awe-inspiring stamping rhythms resonate. The period between the 1920s and 1950s is known as the “Edad de Oro” or Golden Age of flamenco. It was a time in which the majority of the styles took shape and the great referential figures of classical flamenco such as Pepe Marchena and Manolo Caracol appeared. 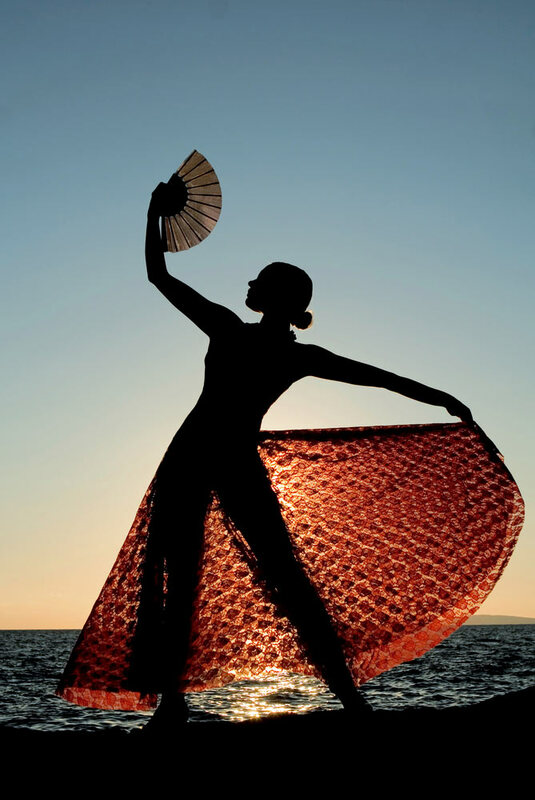 From the 70s onwards, flamenco began to combine with very different styles. Camarón de la Isla, whose popularity soared to what had previously been unimaginable heights, became one of the pioneers upon introducing, along with Paco de Lucía, Arabic, Brazilian and Jazz-like elements into his work. Later on, Raimundo Amador would introduce blues, rock and even reggae into his recordings. 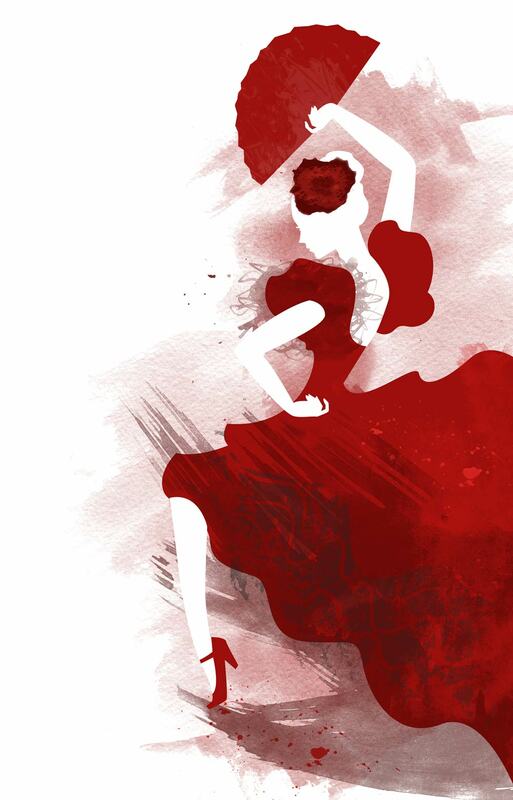 Nowadays, flamenco has moved on from its marginalised beginnings and has been mixed with popular Spanish music of many different styles and standards of quality. However, figures of classical flamenco, such as the successful Duquende, still continue to please the faithful. In Granada there exists a great tradition of flamenco, always associated with the “barrios” (neighbourhoods) where the gypsies traditionally lived: the Albaycin and Sacromonte. The most representative names of Granadadino flamenco are probably that of the “cantaor” Enrique Morente, who has also mixed his music with rock, and those of the Habichuela family. Those who are daring enough to try their hand at flamenco can learn it in the various schools spread throughout the city, the most famous being the “La Mariquilla” school, in Calle Santa Clotilde. And, of course, nobody who visits Granada should leave the city without visiting one of its “zambras” in the flamenco caves of Sacromonte. The “zambras” are flamenco parties in typical caves where the gypsies go to sing and dance. In Sacromonte, some caves charge an entry fee and offer a more or less pre-prepared show, for example the Cueva de María la Canastera or los Tarantos. However, many others, like la Bulería or La Rocío on el Camino del Sacromonte or el Niño de la Almendra in the Albaycin, don’t charge an entry fee and are bars in which spontaneous flamenco performances regularly take place. Enjoying a night of flamenco in one of these “zambras” will often depend on luck and the mood in which the regulars find themselves that night. Keep your eyes and ears open though because the “zambras” tend to have a private room where the owners carry out their real party, hidden from curious eyes. Worming one’s way into one of these can provide the fortunate one with the chance to live a genuine night of flamenco.